Will The First Anti-Aging Pill Be A Drug Or A Nutriceutical? The lead researcher being quoted in news article is Dr. Nir Barzilai, director of the Institute for Aging Research at the Albert Einstein College of Medicine, New York, who serves as a scientific consultant to Oramed Pharmaceuticals, an Israeli-based drug company. Its authors use the advent of the birth control pill as a game-changing development for comparison. This is because estrogen replacement therapy was soon marketed as an “elixir of youth” to “forestall the diseases of ageing and to maintain youthfulness,” said the Australian research team at the School of Population Health, University of Queensland, Brisbane, Australia. Although physicians initially prescribed hormone replacement therapy (estrogen) to temporarily relieve the symptoms of the menopause, it quickly found widespread use to forestall the diseases of ageing and to maintain youthfulness, said the authors. The Australian researchers noted that estrogen pills help to maintain the cosmetic appearance of youthfulness rather than promote longevity, and this is highly desired in any human population. Promoting a pill that would prolong life without looking younger may not be easily adopted by a generation that values youthful appearance. Just look at all the money spent to look younger (hair and skin treatments, contact lenses, cosmetic surgery, etc.). Of course the oft-repeated concerns about over-population, cost and utility are brought to the fore in this impact report. The Australian team cites an earlier report which suggested that an anti-ageing pill would certainly increase population growth unless a pre-condition for its use were an agreement not to reproduce. The Australian team suggests doctors will control access to such a pill, that it will be dispensed by prescription and that it needs to be regulated. But the need to control such a pill is defied by the wide availability of red wine which has been shown to produce longevity at the 3-5 glasses-a-day consumption range. These conventional-thinking doctors see dire consequences from any unregulated nutriceutical, or off-label-prescribed drug. But why would control of an anti-aging pill, beyond its safety and labeling, be needed? Yeah great…I am sure it will be waaayyyy too expensive for the majority of us. Hmm no thanks I’ll go when I go. Just what we need with the worlds population already out of control ! No they should ban these this country’s problems are not helped by people living longer now. More people requiring pensions for longer and care / health care. 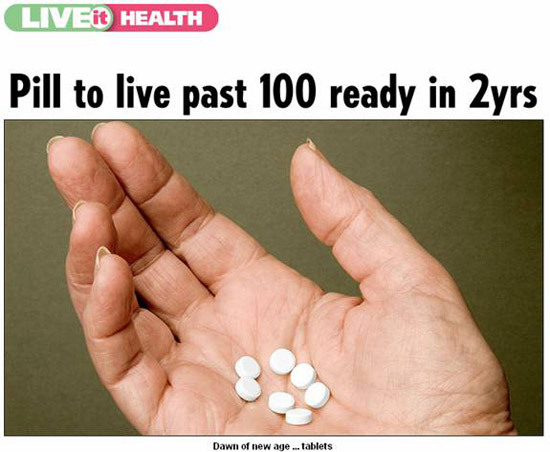 If these pills become available to every one and the majority of people live to be 100, we would all have to start planning on working till we are 70-80 otherwise this country won’t be able to afford to look after anyone. It doesn’t sound like such a pill would be greeted with open arms. Possibly humans who lived generations ago could only dream of an elixir of youth, but today an anti-aging pill is likely to be a hard-sell. After 7 years of promoting red wine resveratrol pills in America, such a pill isn’t even in the top-selling herbal supplements. To the editors EMBO Reports, and, Authors at the School of Population Health, University of Queensland, Brisbane, Australia. Having read your report entitled “Anticipating the anti-ageing pill,” I have a few questions and comments. Would the authors of the paper take such a pill if it were available? It would be interesting to know. An online survey of retirees showed that better than 9 in 10 would NOT take such a pill over fears of adding more years of living in a debilitated, senile state, and concerns over running out of retirement money, and overpopulation. The people who are closest to death’s door are the most unlikely to adopt the idea of an anti-aging pill. Those who are most likely to incorporate such a pill into their daily regimen are middle-aged males who see the ravages of aging in their parents and grandparents and don’t want to grow old. Most people confuse a “living longer pill” with a “looking younger pill.” Your article addresses this to some extent. People don’t want longevity per se, they want thick hair, smooth skin, and viagra! The vain cosmetic aspects of aging are what first come to the public’s mind when you say “anti-aging pill.” Forget living longer, can you get rid of these wrinkles? The lesson here is, for public adoption, you have to address aging of the connective tissue. Your report suggests an anti-aging drug rather than a less-regulated nutriceutical. However, as a drug, an anti-aging pill would likely be unaffordable. Sirtris Pharmaceuticals in USA is developing a resveratrol-based pill that would probably cost ~$5 a day, according to their financial reports. Only the elites of the world could buy it. The Rand Corporation think-tank included an anti-aging pill into the future U.S. Medicare budget, but Medicare is bankrupt and $60 trillion under-funded, and not likely to provide such a pill to retirees. The same concerns you express over an anti-aging pill were discussed when penicillin first came into use. There would be more people on the planet, shortages of food, etc. I think that covert population control efforts, as well as over population control methods such as birth control pills, run contrary to that of an anti-aging pill. Infant mortality rates have dropped dramatically, increasing life expectancy. Now will the world, at a time of great economic crisis, be able to add more years to the end of life? What if I said “we have technology that can increase the quality of life and the human lifespan by 30 years, but we simply can’t afford it.” So do we hide it from the masses? The approval of an anti-aging pill by regulatory authorities is beyond reach. The only conclusive proof would be a 99-year human study, which is obviously impractical and costly. Markers of aging would have to be accepted, such as lipofuscin (cellular debris) accumulation, red blood cell width, mitochondrial dysfunction, gene expression patterns (epigenetics). There appears to be many theories of what causes aging. It would be important to develop an explanation as to why human cells exhibit little or not visible aging during the growth years, progressive aging after full growth is achieved, and then the rate of aging drops a bit in late life. I have correlated these 3 “speeds” of human aging with overmineralization. During childhood growth, major minerals like calcium, iron and copper are directed towards bone growth, red blood cell production and collagen formation. Once childhood growth ceases, minerals begin to accumulate, first in males, later in menopausal females as they cease menstruation and loss of minerals in their monthly blood flow. Full-grown males accumulate iron at the rate of 1 mg per day of life. By mid-life (~age 40 years) a male will have 4 times as much calcium and twice as much iron stored in his body as an equally-aged female, and experience double the rate of diabetes, cancer and heart disease. Women develop the same rate of disease as males with the onset of menopause or early hysterectomy. Only the overmineralization theory explains why human cells age at these three different rates. Chelation of minerals is being demonstrated to exert age-reversal. Your article describes estrogen replacement as restoring youthfulness to women (skin, hair, bone, mood), however because of its downsides (cancer), a search for an alterative is underway. Resveratrol, a molecule extolled for its anti-aging properties, is a phytoestrogen that would potentially act as hormone replacement as it has been deemed to be relatively safe and not promote cancer. Resveratrol is also a copper chelator. A resveratrol-based mineral-chelating pill has been developed, designed around the overmineralization theory. It has been demonstrated to remove lipofuscin from human tissue (retina) with an accompanying clinical improvement in visual and mental function. We just received new batch of Longevix 2 weeks ago. Both my husband and I are having a cascade of migraines since beginning this batch Longevix. We stopped the drug yesterday but still have migraines. Something is terrribly wrong with Longevix. Before we experienced no side effects. Janet, thank you for sharing this side effect. You will notice that young women often experience migraines around the time of their monthly cycle. This is a sign of anemia. You need to add some copper and iron to your diet (via foods, not pills) and/or take Longevinex less often, maybe every other day. This is a good sign, that you are not iron/copper overloaded. Cocoa powder and nuts provide stable copper. Red meat is the richest source of highly-absorbed iron and copper. Iron is also available from molasses and spinach and raisins. Adding vitamin C to a meal will increase iron absorption from foods. Other signs of anemia include fatigue, cold fingers and toes, craving ice chips, acidic foods like tomatoes, Achilles heel tendonitis (lack of copper for collagen), pale skin, need to take naps. One point I would take issue with is the references to population growth. around 2050 and start to decline from there. In fact, one report described the projected decline as a population implosion that could rival the population implosion the black death caused in Europe during the middle ages. Further, the demographic studies indicate that the coming population decline can’t be stopped even if we started trying to reverse it today. In short, concern about increased longevity contributing to over population has no basis in fact. Yes, in Western societies population growth is stagnant. With developed economies, women exercise a limitation in the number of babies they have on their own, without government interference. Populations in Japan, Western Europe, Italy, North America, are declining. The population in Russia is on the decline due to rampant alcoholism and poor public hygiene. Yes, once something like this is documented to work for people then the government will make it available for all the citizens real cheap, and at the same time feel free to raise the social security pay out to 90 yaears of age. Knowing even a smaller percentage of people will live to collect it because of other factors like smoking, drinking, lifestyle, and they will have even more of our money to spend foolishly. Few people will realize there is only a charade going on to produce and deliver an anti-aging pill. Such a pill would save Medicare from certain bankruptcy as people would live more years in good health. Right now the prevailing approach to health is to treat every disease as it occurs as if it were a drug deficiency and never to prevent the onset of any age-related disease. The system is rigged to generate more disease to treat. It is not a “health care” system it is a “disease care” system. Those people who seek health and longevity are going to be on their own to find it. Is there a study or studies that offers definitive, undebatable, evidence of significant prolonged life span in humans using Resveratrol, or any other anti-aging product? Is so, please send me a link on the study. Don, this is a very common request. Unfortunately, it is impossible to conduct a conclusive study in humans to prove longevity effects. This is because it would require a 99-year study. Or at least a study where people begin to take a pill at, let’s say, age 40 onwards. The National Institutes of Health has an ongoing monitoring program among people living in Framingham, Massachusetts, which began in 1948, but it is not a longevity study, though data can be analyzed for that, but it will still take many decades to decipher. There will be human data to review by all Longevinex users soon. There are three studies ongoing overseas at the present time. We had to conduct these studies outside the U.S. as there is too much interference here in the U.S. One drug company interfered with a planned university study using Longevinex among Alzheimer’s patients (they bought off the university and got them to study their drug.) Another study was sabotaged by investigators themselves as the human subjects they chose for the study failed to take the pills and the monitors failed to do their job. I am a believer in Resveratrol, but how does one go about figuring out what the equivalent or 3-5 glasses of day is in pill form? We have all heard that too much Resveratrol can have adverse effects. Professor Roger Corder of the William Harvey Research Institute in London, author of The Red Wine Diet, attempts to answer this question in his book. His point is that the French are living longer on 3-5 glasses of aged, dark red wine a day, which provides very little resveratrol, maybe 1 milligram per glass, but 60 milligrams of total polyphenolic molecules (resveratrol, quercetin, catechin, ferulic acid, kaempferol, gallic acid, tyrosol, malvidin, others). These molecules would represent what we would call wine solids. Professor Corder believes it is the combination of these molecules that produce the healthy benefits of red wine. That would be about 180-300 milligrams of these molecules a day. Other corroborative studies show that the combination of relatively low doses of polyphenolic molecules produces synergistic (more than additive) effects. This was demonstrated in a study using Longevinex, which provides 250 milligrams of resveratrol, quercetin, ferulic acid and IP6 from rice bran, to activate 9-fold more genes than resveratrol alone. It is also interesting to note the work of Dipak Das PhD at the University of Connecticut. His research shows that 175-350 mg of resveratrol alone will reduce damage to heart tissue should a heart attack occur (animal study), averting a mortal outcome, but that much higher doses of resveratrol, 1750-3500 mg, would cause more damage to the heart. So we find a safe and effective dosage range here for resveratrol that is similar to the range of total polyphenols consumed by French wine drinkers. Dr. Corder notes that every red wine will not provide the same amount of polyphenols. Wines that are fermented and aged longer (these would be darker reds) provide more of these molecules. Try a South American malbec wine for an example. Of course the idea of a red wine pill is to provide the health benefits of red wine without the alcohol. Furthermore, 3-5 glasses of red wine a day is a bit expensive ($3-7). Longevinex will soon be shown in an upcoming published study to exert heart-protective action at a far-lower dose of resveratrol (100 mg per 160 lb human) than prior studies, and offering a dosage range of safety that is unparalleled by any other resveratrol pill.